The UK’s first Certified Hot Tub Technician course took place in February, with members of the 1 Stop Spas team. Five members of the Lincolnshire-based 1 Stop Spas team have become the first APSP Certified Hot Tub Technicians in the UK. 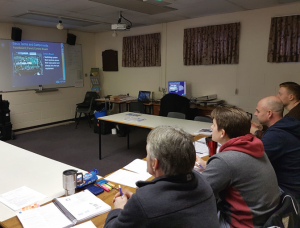 The engineers were the first outside of North America to complete the new Certified Hot Tub Technician (CHTT) course, hosted by SpaTech Training. The intensive program covers the essentials of servicing portable and permanently installed hot tubs and spas, and equipment repair and replacement. Upon completion of the program, delegates are eligible to take the CHTT exam to become fully-fledged certified technicians. Chris Brady, CHTT tutor and Managing Director of SpaTech Training commented: “This specialist program is the first of its kind in the UK and we’re delighted that the pilot course has been such a success. “The first four candidates not only completed the CHTT course but also passed their independent exams and received their CHTT certificates and badges – which will be worn as a sign of their competence and professionalism within the industry.” SpaTech Training is an Association of Pool and Spa Professionals (APSP) Certified Training Provider for the UK and is also approved by BISHTA.